Ok, you own a chainsaw and feel confident that you can cut up that tree if it is laying on the ground, but you are not sure you want to be cutting it down yourself...OR...you felt that the tree would fall right over there and got busy cutting it down, but now it is hung up in some other nearby trees...or on your roof. This happens more frequently than you would think. Customers have called me to remove trees laying on their sheds or houses that they were sure would fall the other way. 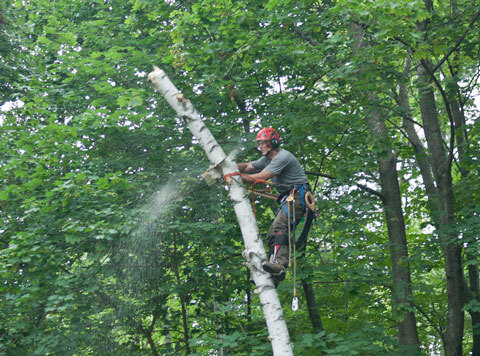 Tree felling is an art that takes much experience to master. There is a lot more to it than simply running a chainsaw through the trunk! Every sawyer I have ever talked to has his share of horror stories and mistakes that taught valuable lessons. If you have a job that you wish to participate in, or complete give us a call to discuss it. If you have a tree hung up, PLEASE call and be safe.